China's top legislature Wednesday heard a report on the central government's final accounts and an audit report for 2017 at a plenary meeting of its ongoing bimonthly session, which runs Tuesday to Friday. 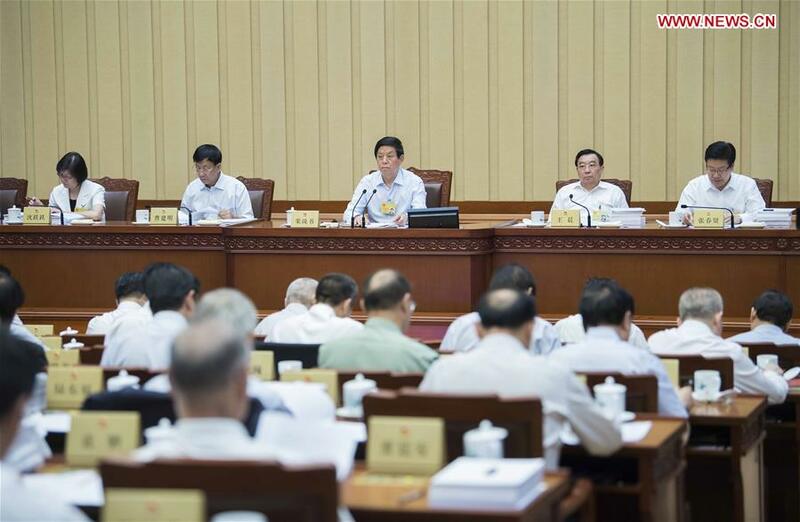 Li Zhanshu, chairman of the National People's Congress (NPC) Standing Committee, attended the plenary meeting. Entrusted by the State Council, Finance Minister Liu Kun delivered the report on 2017 final accounts. The central government's general public budget revenue was 8.11 trillion yuan (1.25 trillion U.S. dollars), while the general public budget expenditure was 9.49 trillion yuan, accounting for 103.2 percent and 99.1 percent of the budget respectively, Liu said. Liu said the ministry would strengthen management on budget enforcement, help win the "three tough battles" and speed up fiscal and tax system reform. The three tough battles refer to defusing major financial risks, targeted poverty alleviation and preventing pollution. Entrusted by the State Council, Hu Zejun, head of the National Audit Office, made an audit report on enforcement of central government's 2017 budget and other fiscal revenue and expenditure. Efforts should be made to increase efficiency on financial resource allocation, promote high-quality development and improve measures related to the three tough battles, according to the audit report. The meeting also heard a report on the examination results of the draft 2017 final accounts made by Xu Shaoshi, chairman of the NPC Financial and Economic Committee. Xu called for efforts to advance fiscal and tax system reform, strengthen budgetary work and final accounts and rectify problems uncovered during auditing. Wang Chen, vice chairman of NPC Standing Committee, presided over Wednesday's meeting. In addition, panel discussions were held to deliberate bills on two draft revisions of laws on the organization of courts and procuratorates to prevent intervention in judicial affairs.